Microsoft has begun teasing the reveal of its next generation of Windows graphics API. It would appear that Redmond is not going to let AMD’s new Mantle API hog all the glory for the next generation of gaming. The splash page displays the apparent partners for the next DirectX, which surprisingly includes AMD itself.Chances are that AMD is there to ensure that all their bases are covered, since the current generation of games still run on DirectX. This new version of DX is currently reported as being “closer to the metal”. The meaning of which we will learn on 20 March 2014. 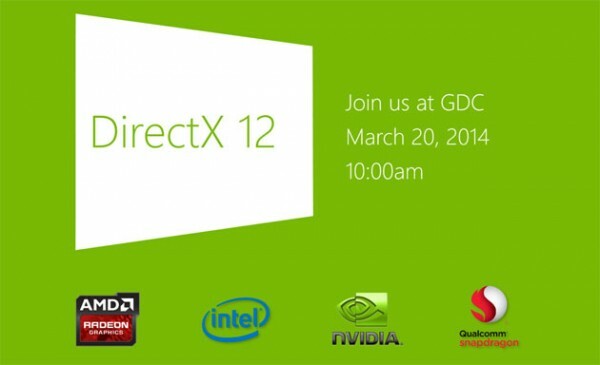 If anything, Extremetech has made the argument that DX12 won’t be available for another 12-18 months. If only because Microsoft appears to be syncing new DX installations with major Windows updates (DX11.1 in Windows 8 and DX11.2 in Windows 8.1). Following this logic, DirectX 12 will only be available for the next iteration of Windows.